SciPlay is a developer and publisher of digital games on mobile and web platforms. In 2018, cash flow from operations was $76.9 million, 23% more than that in 2017. Using a ratio of 3.4x forward sales, SciPlay should have an enterprise value of $1.625 billion. SciPlay does not expect to have an independent Board of Directors. As a result, directors may make decisions to benefit the largest shareholder, which may damage the interests of minority stockholders. SciPlay expects to enter into a $150 million revolving credit agreement, which may increase the company's financial risk quite a bit. Reporting 15% revenue growth and positive CFO, SciPlay (SCPL) should attract the attention of both value investors and growth investors. Using an EV/sales ratio of 3.4x and forward sales of $478 million, SciPlay should have, after the IPO, an enterprise value of $1.625 billion. Having said these beneficial features, there are two detrimental facts that investors should get to know. First of all, the company expects to enter into a $150 million revolving credit agreement, which should increase the financial risk. 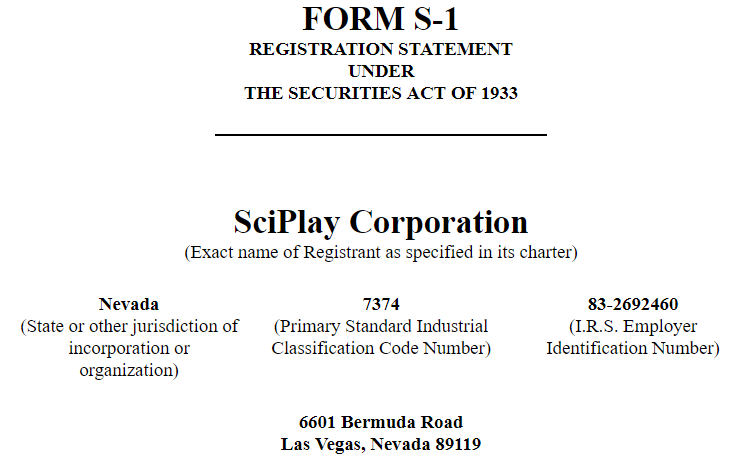 In addition, SciPlay is a controlled company, and the Board of Directors is not expected to be independent. Founded in 1997, SciPlay is a developer and publisher of digital games on mobile and web platforms. With regulators in the US working together to assess the characteristics of video games and social gaming, the gaming industry may have a difficult time. Right now, making money while implementing the applicable laws and regulations should not be that easy. With an asset/liability ratio of 3.4x, the company's financial situation seems stable. Having mentioned this appealing feature, there is goodwill worth $120 million, which investors should study closely. It represents 61% of the total amount of assets, which may be a risk for certain investors. Keep in mind that accountants could impair these assets leading to share price depreciation. It is impossible to review all the acquisitions executed by SciPlay. However, let's review one to understand the amount of goodwill and intangible assets registered. As shown in the image below, in the acquisition of Spicerack, goodwill and intangible assets represented 96% of the total amount of the purchase price paid. The list of liabilities is shown below. As of December 31, 2018, it is very positive that SciPlay does not have large financial debt. It reports only $3.7 million due to an affiliate. Among the list of competitors, only Zynga Inc. and Glu Mobile have a size close to the size of SciPlay. As shown in the image below, ZNGA and GLUU report market capitalization of $5 billion and $1.6 billion respectively. They trade at 3.3-3.4x forward sales with almost no financial debt and revenue growth of 5% to 27%. With revenue of $416 million and revenue growth of 15%, assuming forward sales of $478 million is reasonable. 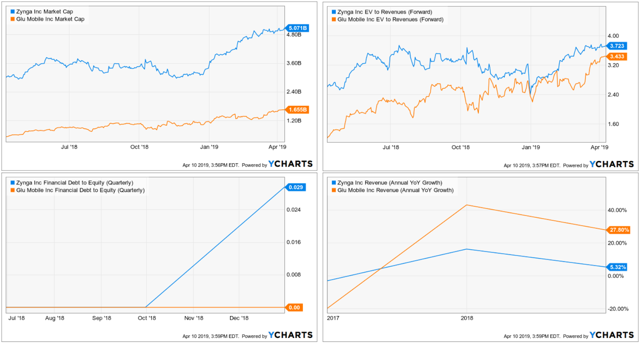 Using a ratio of 3.4x forward sales, SciPlay should have an enterprise value of $1.625 billion. Having said this, if the company enters into the $150 million revolving facility, market participants may push the valuation of SciPlay a bit down. "Following this offering, we intend to rely on all of these exemptions. As a result, we will not have a majority of independent directors"
With 15% revenue growth and positive CFO, both growth investors and value investors should review this name. Using the ratio of peers, equal to 3.4x, SciPlay should have an enterprise value of $1.625 billion. With that being said, there are two features that investors may not welcome. Firstly, SciPlay expects to enter into a $150 million revolving credit agreement, which may increase the company's financial risk quite a bit. In addition, the Board of Directors may not be independent, which could harm the interests of minority shareholders. As a result, the total valuation of SciPlay may be a bit lower than $1.625 billion. Keep in mind that certain investors don't invest in controlled companies.